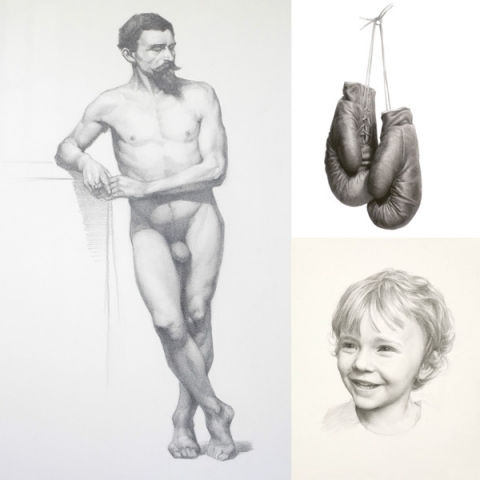 Vancouver based artist, Mandy Boursicot’s skills with a graphite pencil have elevated the hyper-realism of her artwork, and set her career on a steady course forward. She’s invested years in the pursuit of academic art, and is now back from her 4 year tenure as both a student and teacher in Florence, Italy. Mandy is ready to continue the time-honored tradition of both practicing her art, and teaching others the skills she has learned from the great Masters. 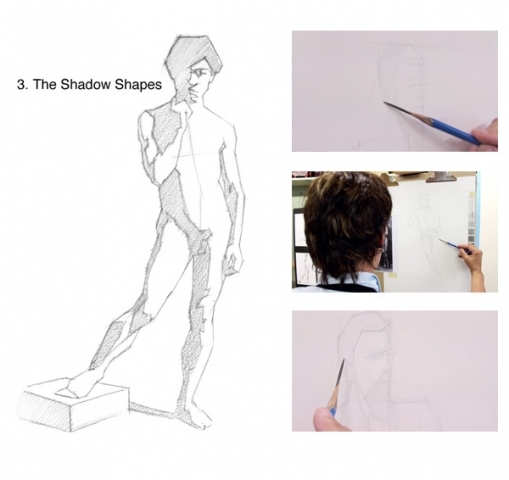 Join Mandy as she demonstrates the 8 steps she uses for creating realistic figure and portrait drawings. 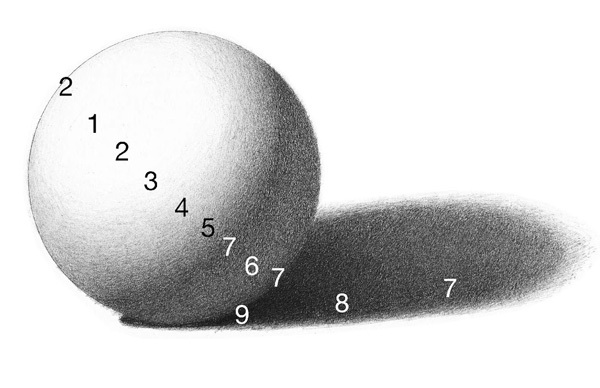 By using the simple yet powerful pencil, learn the importance of how light reveals the form, and how to effectively render the lights and the shadows. Whether you are a beginner or just need a refresher, this in depth how-to video is sure to inspire the inner drawing master in all of us. 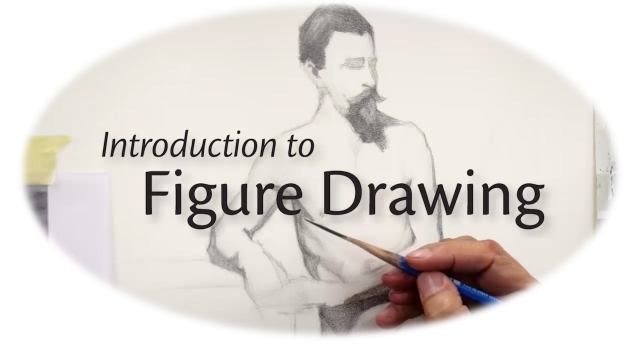 Watch Introduction to Figure Drawing above and read the full article below for more information on getting started with your figure drawing. Interested in some of the products Mandy uses? We have all used an HB pencil before, but what exactly does that HB mean? Every pencil is graded with either a B, HB, or H value. Pencils valued with a B are made out of softer graphite, while pencils valued with an H are made from harder graphite. The hardness of the graphite directly affects how much of it you are able to apply to paper. Softer pencils like 3B and 2B will lay down more graphite, meaning you can achieve darker values in your drawing. Harder pencils like 3H and 2H will lay down less graphite on the page, allowing for softer gradations of tone. HB is in the middle of the road when it comes to hardness. This makes it great for creating mid-tones as it can be shaded up or down depending on how much pressure is applied. 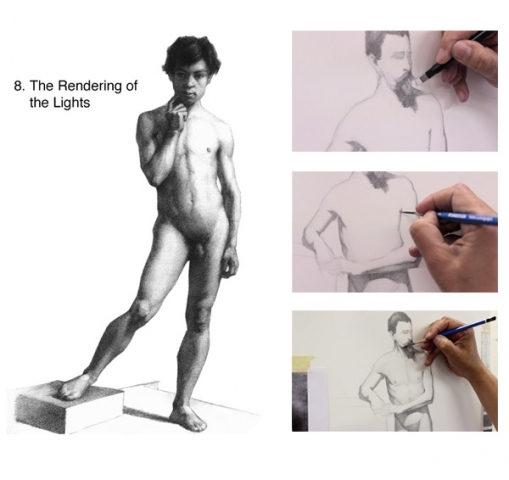 Understanding which pencils to use, and when to use them, is essential when using classical drawing methods. 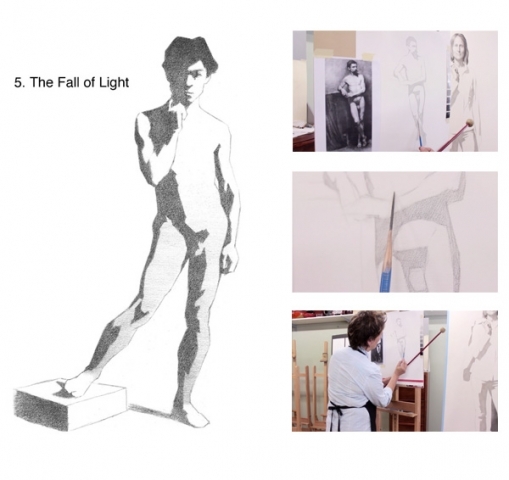 In classical drawing, a range of values are used to convey the volume of a form. In the example pictured below, we are using 9 values – value #1 is the colour of the paper and #9 is the darkest black we can achieve with our medium. Image courtesy of Mandy Bouriscot. Creating a value strip using this system is incredibly beneficial to any artist. By understanding this concept, you will become familiar with which pencils to use to get the varied values on your strip and how hard you need to control the pressure on the pencil to achieve that value. Visit Mandy’s blog for step-by-step instructions on how to create your own value strip. Tip: By nature, graphite reflects light the more it is layered over top of itself. This means it will always have a shine to it if used to create dark shadows (blacks). The goal of realistic shadows is to have them fall back in the drawing, which is hard to achieve when the shadows reflect the light around it. To avoid this shine, you must use carbon pencil, charcoal, or even paint to render your absolute blacks. By incorporating these mediums into your artistic tool belt you can not only add greater depth and realism to your drawings, but you can also extend the life of your pencils. If you decide to stick with one medium only, then several controlled layers of graphite are needed for the darks, rather than pressing down very hard with fewer layers. 1. 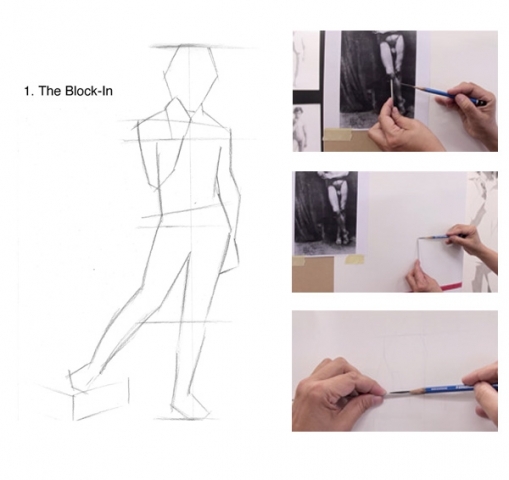 The Block-In: Spend the first 5 minutes observing the model in your Master Copy Image (a reference photo of a drawing done by a Master; this ensures we are duplicating proper technique). Assess the pose and balance to determine where the plumb line (the vertical grid) is on your figure. Divide the figure into 4 parts using a ruler or knitting needle: mark the top, bottom, upper quarter, and bottom quarter. By working within these 4 sections we can divide the figure evenly and it allows us to use comparative measurements to proportionally scale the figure bigger or smaller then the Master Copy image. On your paper, mark the top and bottom of the figure with a 2B pencil and draw the plumb line according to the measured quarter marks on the model. Use a mahlstick to keep your hand off of the paper and to give it a place to rest while drawing. Focus only on getting the big proportions right. Use comparative measurements to block in the feet, legs, and knees, up until the waist. Continue laying down loose and sketchy lines to illustrate the changes of direction in any bent joints such as the knees, elbows and waist. Once at the armpits, work from the head down to the arms. Tip: Before you begin, carefully consider the paper you will be using. How heavy do you want the paper to be? Do you want a cool white or a warmer white toned paper? For the best results use professional quality papers like Stonehenge or Canson Mi-Teintes because they provide an excellent tooth and come in a wide variety of tones and weights. This tooth is essential for picking up all the layers of graphite that are needed for creating complex figure drawings. Not only that, but it also lets go of the graphite easier, meaning it will not leave marks when you erase. 2. The Construct: This stage is quick, yet crucial. Observe where the centre line of the model’s torso is and that is where the construction line will go. 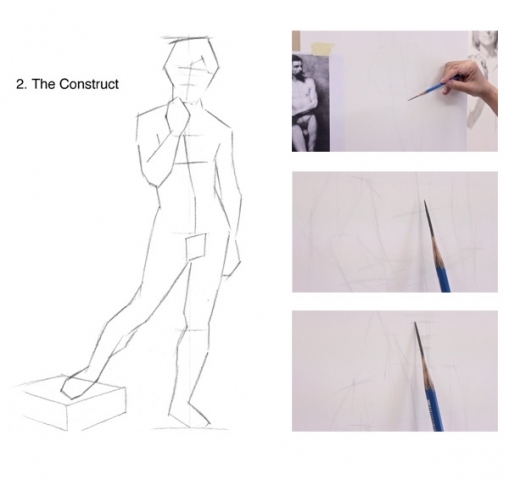 It will give the gesture and swing of the torso, as well as dividing the left and right of the model for proper perspective. Place another horizontal construction line through the centre line to mark where the pecs or breasts will go, and do the same for the head, as a guide for feature lines. 3. The Shadow Shapes: Determine where the light source is coming from in the Master Copy as this will dictate where the shadow shapes will go. First map in where the shadow edge is, and then place a light tone in the shadow areas with a 2B pencil to help define the overall shape of the shadows. Once the shadow shapes are placed, use a kneadable eraser to remove the construction lines. 4. Articulation: Now our simple line drawing becomes one that is concerned with masses. Assess whether the proportions are correct and adjust accordingly. Most importantly, decide whether the top quarter has been properly apportioned to the head and shoulders. In this step, we aim to create a two-tone light and dark silhouette. The two-tones being the white of the paper for the lights and a darker tone for the shadows. Ensure to make no differentiation between anything in the lights or in the darks. We should carefully observe small changes of direction for the outer contour as well as the inner contour of the shadow edge, and articulate these accurately. 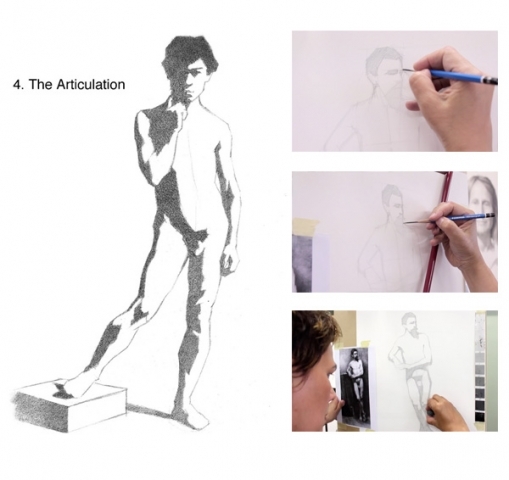 Tip: A method called Straight Line Articulation is essential when creating a figure drawing. Draw and shade in linear lines that follow the contours of the body. This allows you to see exactly where forms change direction and gives a higher level of accuracy and structure to the drawing. 5. The Fall of Light: This stage and the next are only concerned with establishing a context for the lights. The fall of light is the idea that the brightness of our single overhead light source diminishes as it travels further away from that source. So the top part of the model will receive brighter light and then it will gradually drop off the further down it travels on our model. Using the same value system described above will help in shading the fall of light. As a reminder, Value #1 will be the white of the paper, Value #5 being mid-tones, and Value #9 being the darkest shadow. Place a smooth gradation of tone from the ankles up to the bottom of the rib-cage. Start with a Value #3 around the ankles and gradate slowly and evenly until you reach Value #1 (the white of the paper) at the bottom of the rib-cage. 6. 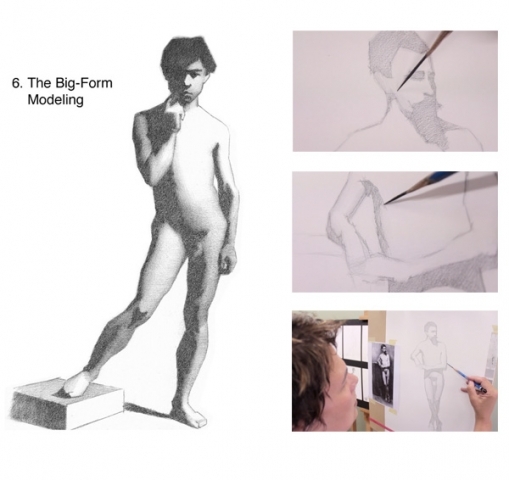 Big From Modeling: Step back from drawing all the details of the model and engage your conceptual brain. See each part of the model in its most basic geometric form. Keep to our guiding principle and work from the biggest form, the biggest idea, to smaller and smaller ideas and forms. Over top of the fall of light, model the big forms of all the limb segments as cylinders, the torso as a flattened cylinder, and the head as an elongated sphere or ovoid. Work on the semi-spheres of the shoulders and the cubes of the joints, such as the knees. 7. Variations of the Darks: In this step, all of our shadows will come to a complete finish. The darkest areas will be done with a 3B and the lightest pencil to be used is an HB. Deal with the absolute darkest areas first, which is usually the hair in shadow. Then move to the bed-bug line which is the boarder where light meets shadow. By establishing the bed-bug lines our form will begin to turn, and to help with this turning effect, forms will need to be slightly darkened as we approach the outer contour of the figure. The tonal range of the darks should be minimized, so that the eye is less drawn to them. Pay special attention to differentiate form shadows (shadows belonging to planes that are facing away from the light source) and cast shadows (shadows made by something obstructing the light’s trajectory) to further enhance the variety of shadow tones. 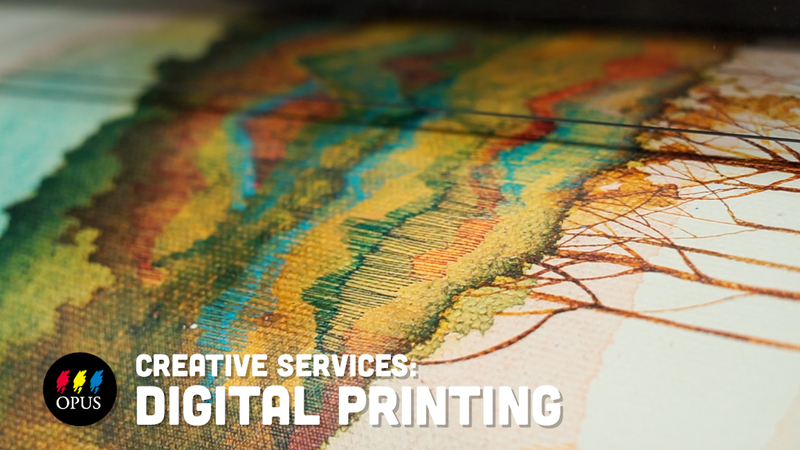 Look for opportunities to include lost edges and to soften edges where they need to recede. 8. Rendering of the Lights: Time needs to slow down when you begin rendering the lights as you want to take special care to render them beautifully. This is where the harder pencils (2H or 3H) will be needed. The darkest pencil you should be using in this step is an HB. Render each form segment by segment to help maintain the dominance of the governing larger volumes. Use a Tombow Mono Zero Eraser to sharpen up edges, refine small details, and to further render the lights within your model. Small details must always be subject to fitting into the larger context and each form must have a light, mid, and dark value to create the illusion of volume. Yes indeed, “Assess” is the correct word. Fixed now. Thank you for your keen eyes.